On a sunny morning in August 2012, Catherine and Rick Bernt stepped onto the Bob Kerrey Pedestrian Bridge and into the rest of their lives. Their small, picturesque wedding at the Missouri River’s edge was the perfect way to start a lifetime together. But within an hour of saying “I do,” a single phone call cast a shadow over their day of celebration. It was Catherine’s doctor confirming her diagnosis. Cervical cancer. 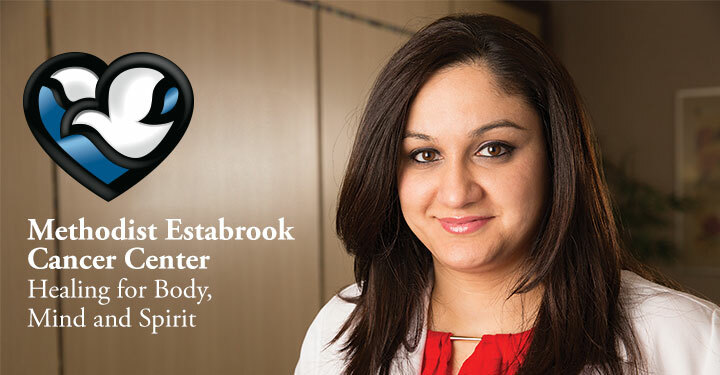 Catherine’s gynecologist referred her to Niyati Nadkarni, MD, a gynecologic oncologist with Midwest GYN Oncology at Methodist Estabrook Cancer Center. Minutes after walking into Dr. Nadkarni’s office, Catherine felt a sense of relief knowing that the female oncologist — one of only two female gynecologic oncologists in the state — would handle her care. Catherine is among the nearly 2,000 newly diagnosed cancer patients each year who turn to the multidisciplinary care, state-of-the-art technology, cutting-edge clinical trials and comprehensive support services offered by Methodist Estabrook Cancer Center. Here, a holistic approach to healing body, mind and spirit is coupled with the best treatments medicine has to offer. A patient-centered team approach is at the heart of care provided at Methodist Estabrook Cancer Center. Each week, teams of specialists in their respective tumor-site-specific fields spend hours analyzing patient care from their unique perspectives. There are nearly 20 different meetings every month, and everyone has a seat at the table: radiation oncologists, medical oncologists, surgeons, pathologists, nurses and more. "She always talked to other doctors about my case, and I really felt like there was a team of people rather than just one opinion." The best option in some cases may be for a patient to participate in one of many clinical trials. Methodist Estabrook Cancer Center offers more cancer-related clinical trials than any other regional cancer center*, and is one of the country’s leaders in offering new options for patient care. Methodist Estabrook Cancer Center currently offers nearly 80 clinical trials, and 17 percent of eligible patients are trial participants*— the national average is two to three percent. Patients say they appreciate having all that information and a team of doctors working for their overall health. Kim Dobson always figured she’d get cancer one day. She was at work as an administrative assistant at Arlington Public Schools in Arlington, Neb., when she learned about her diagnosis. After learning about her diagnosis, a friend referred Kim to Dr. Reilly and physicians at Methodist Estabrook Cancer Center — a referral she said made all the difference. That powerful experience begins the moment a patient enters Methodist Estabrook Cancer Center. A welcoming hug, friendly smile and knowledgeable staff bring caring to a personal level. It’s a place of holistic healing that takes into consideration every aspect of care — from physical wellness and behavioral health to financial assistance and cosmetology. The support resources provided through Harper’s Hope, a comprehensive cancer survivorship program, take care and healing to the next level. Thanks to a generous contribution to the Methodist Hospital Foundation, Harper’s Hope services are available to all cancer survivors, regardless of where they seek treatment or their ability to pay. One of those services, Inner Beauty: A Specialty Salon for Cancer Survivors, allows patients to consult with a specially trained clinical cosmetologist and certified mastectomy fitter to find the breast care, skin care, makeup and wigs that will work best for them as they go through the physical changes treatment brings. Harper’s Hope physical wellness programs offer massage and exercise classes such as aerobics, Pilates, yoga, Tai Chi and strength training. Social service professionals are also on staff to help with caregiver concerns, transportation, financial assistance and referrals to other services that make life easier during and after treatment. And a registered dietitian, board-certified as a specialist in oncology nutrition, can also provide eating tips and recipes and help with supplements. During their most difficult times, survivors and families rely on the people and many programs offered at Methodist Estabrook Cancer Center to find help, healing and hope. Today, Kim and Catherine are both in good health. Their cancers are in remission and their ongoing care at Methodist Estabrook Cancer Center has them confident about the future. After a year in and out of the hospital with surgeries and struggles with related health issues, Catherine and her new husband are taking their new life together one day at a time.